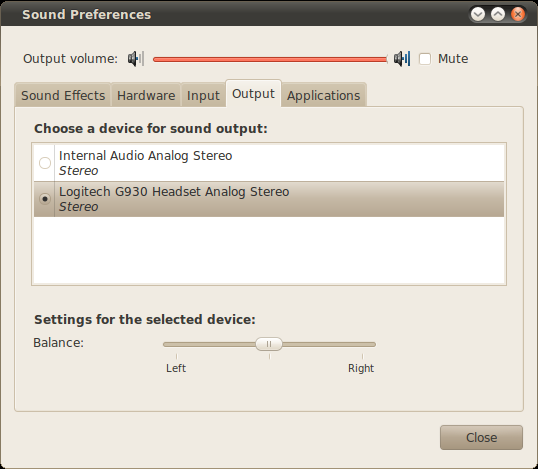 USB wireless headsets can be a bit of a hit and miss affair on Linux. Stories abound of these devices failing to work, people not being able to use them for Skype, etc. I'm running Ubuntu 10.04 (Lucid Lynx) on my somewhat aging Dell Latitude D820 laptop, but recently decided to give one of those headsets a try: The Logitech G930. Here I am describing how it's performing for me. For many years, I have used cheap wired headsets with ordinary analog audio headphone/mic plugs. But I'm spending a lot of time on Skype, talking to my overseas colleagues and customers. Since it seems to help me think, I have the tendency to walk around during discussions, usually just in circles in my home-office. But even for this small distance from my desk, wired headsets get in the way. So, a comfortable fitting wireless headset would be great. While general USB support on Linux is excellent, wireless USB headsets historically were not very well supported, which is why I have been hesitant to try them out. I was looking around for a good RF-based headset, but what I found was either very pricey or just headphones (without a microphone). 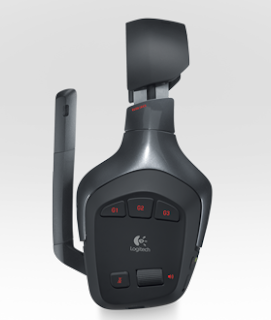 Then I came across some reports of people claiming to successfully use the Logitech G930 wireless USB headset on Linux. While this is marketed as a “gaming headset”, I figured that as long as it worked, I wouldn't care what it's called. So, with some trepidation, I decided to order this headset from Amazon. Pricing for this product can differ quite a bit, but you should expect to spend somewhere between US$90 to US$120. The headset arrived a few days later. In the packaging I found the headset itself, which feels like a solidly made device. It is very light and provides ample space around your ears, so it remains comfortable even for longer usage. 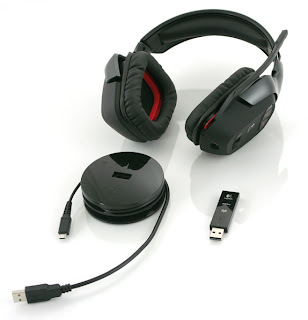 There is also a USB connected base station – which conveniently also contains the charger cable for the headset itself – and a USB stick with the actual dongle for the wireless connection. You can see it all in this picture here (all images in this article – except screenshots – are courtesy of Logitech or DesktopReview.com). The 'base station' is a purely passive device. Basically, a fancy USB cable or hub with a drum to tidily roll up your cables. You can see that it contains a single USB plug at the top. This allows the wireless dongle to be plugged in there, rather than into one of the ports of your computer. That is very welcome, since the dongle is quite long and would inevitably be bumped-in or bent. You avoid this danger by plugging it into that base station and placing it somewhere out of the way. 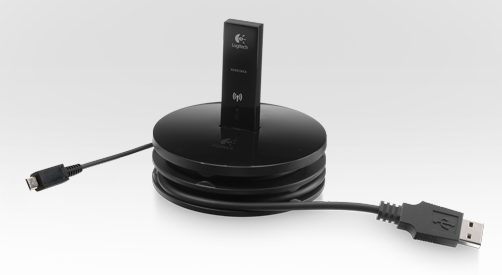 The second, smaller cable from the base station is used to charge your headset. Fortunately, the headset works even while charging. The USB dongle may also be plugged straight into the computer, in which case the cable roll is not needed for operation. The microphone feels solid and automatically mutes itself if it is flipped upwards. There is also a mute button on the left ear cup. When muted, a small red light at the end of the microphone serves as visual reminder to the wearer. A nice feature. The microphone beam actually is flexible so that it can be bent towards your mouth when talking. This probably also prevents it from breaking easily should the headset be dropped. The entire microphone connection and assembly feels solid and well done. Additional controls on the left ear cup are a roller for volume, an on-off button, a Dolby 7.1 surround button and three special effect G-buttons, which supposedly can be programmed with various functions. There is some software that comes in the packaging, but as usual, it is Windows only. So, I ignored it and just plugged in the base station cable and USB dongle, switched on the headphones, waited for the green light on dongle and headset to indicate a good connection and anxiously wondered what would happened. At first nothing. Music output continued on my laptop's built-in speakers. But in no time, I noticed that a new sound device had been identified: When you open the PulseAudio volume control application, you can see it in the Output and Input tabs: Logitech G930 Headset Analog Stereo for output and Logitech G930 Headset Analog Mono for input. I have to say, I was very happy to see that without any special software the device was correctly recognized. Compliments to Linux's great USB support. I selected the Logitech device in both the input and output tap, restarted my music player and there it was: Wireless sound in my new headset! Then I started Skype and made my first test call, which worked as well! The microphone was recognized and used without problem. I did not have to change any settings in Skype. In fact, the sound quality of the microphone is very good, better than with previous standard wired headsets. The built-in sound card in my laptop had always produced a slight crackle whenever I used the microphone. Annoying for others in conference calls or when I wanted to record voice-overs for screencasts. However, with this USB headset there was no crackle at all, just a nice and clear recording. The roller for volume adjustments works well. However, it does not change the headset volume alone, but actually the volume for the entire system. Using it has the same effect as using the ACPI volume buttons on my laptop, with the familiar volume notifier appearing in the upper right corner of my desktop when the roller is used. 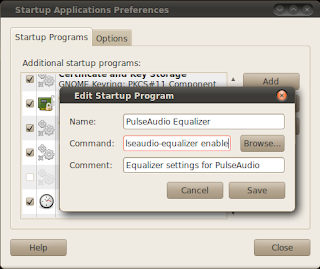 Notice that when active, the equalizer appears as its own output device, which has to be selected. It's a good idea to start the equalizer whenever you login. For that, go to System > Preferences > Startup Applications. Click 'Add' to enter a new startup-application. Enter “pulseaudio-equalizer enable” in the command field, as shown here. That way, the equalizer always starts and its settings are applied. Please make sure to not turn up the low frequency too high. If you do, you will get some pretty nasty distortions or clipping on louder bass tones. 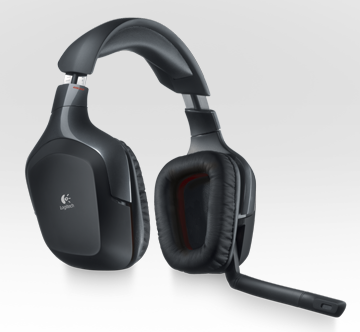 However, my settings shown above are probably quite moderate, avoid those distortions and result in great sound with the Logitech G930 headset. The range and quality of the wireless signal is impressive. I have walked out my room, down a pretty long corridor, with the signal having to traverse 'around' a TV, through a heavy door and pretty stable wall and along the corridor. Only then were the first distortions audible. The range is advertised as 40 feet, but I would think it's actually more than that. The programmable “G buttons” on the left ear cup don't do anything. On Windows, using Logitech's provided software, you can program them with various functions, such as voice morph, or special application specific shortcuts. It would be nice if I could program those on Linux as well, for example to pause my music player, or to pick up an incoming Skype call. Sadly, it's not meant to be, unless Logitech (or some enterprising soul) manages to release useful Linux software for this task. The Dolby Surround Sound button has no effect. Since I don't use the headset for gaming, though, this doesn't concern me much. When you adjust the volume, either with your computer's ACPI buttons or the roller on the side of the headset, sometimes a faint crackling is audible. It's not really very bothersome, since it's only there right when you change the volume, but I noticed it nevertheless. The ear cups are nicely padded and thus muffle any ambient noise well. However, when you are in a VoIP call, you therefore also have no good feeling for the sound or volume of your own voice. It doesn't seem to be possible to redirect your microphone input to the headset speakers. This, however, seems to be more of a PulseAudio limitation than of the headset. I tried to switch-on the loopback module for PulseAudio, but there is too much of a delay to make this useful. So, when using VoIP, you have to be a bit mindful of your own voice. You can get used to it, though. For some reason, I cannot switch sound devices in the middle of a song. In fact, when I want to switch to the external speakers, or back to the USB headset, I have to do that switch in the Input and Output device dialogs of the PulseAudio volume control application. And even then at first nothing changes. I actually have to restart my sound applications (Skype, gnome-player, etc.) before the change is recognized. Quite annoying. Again, this seems to be mostly a PulseAudio limitation, and doesn't appear to have anything to do with the Logitech headset per-se. However, after always using the standard, built-in sound card and cheap headphones where changing devices was merely a matter of pulling a plug, I certainly noticed that particular aspect. Pulling the plug on the USB dongle turned out to be not a good idea: Doing so at some point locked up my computer. So, switching the devices in software is the preferred way. A properly working and simple to use PulseAudio device chooser application would be great. There is a package with exactly this name in the Ubuntu repositories, but it does not do – at least not easily – what the name seems to promise. For the most part the Logitech G930 on Ubuntu (10.04 and most likely also later versions) has been a very positive “works out of the box” experience for me. Great sound quality, comfortable to wear, good for music and VoIP, good build quality. I'm happy with my purchase. While there is room for improvement, I would certainly recommend the headphones for use on Linux already.